Artcrimes: "In Spite Of...." Art exhibition and event 2011... AT LAST ! "In Spite Of...." Art exhibition and event 2011... AT LAST ! 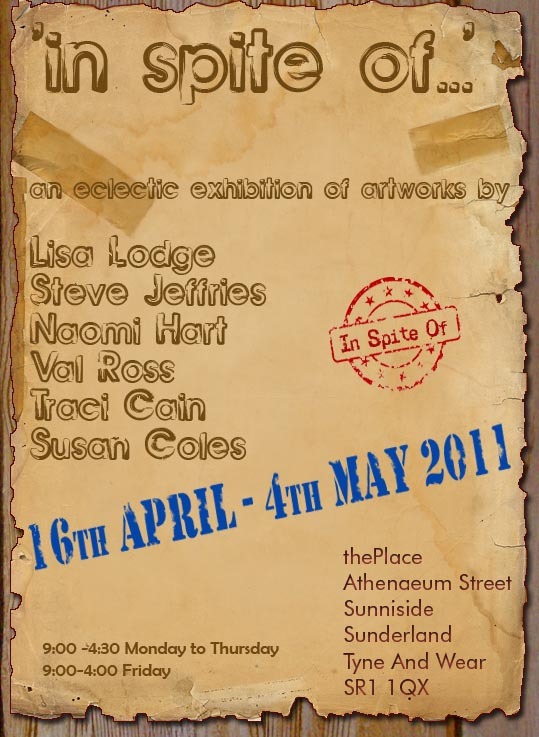 “In Spite Of….” an exhibition of eclectic art work by Val Ross, Susan Coles, Traci Cain, Steve Jeffries, Naomi Hart and Lisa Lodge, opened at “ The Place “, Sunniside, Sunderland, on 16th April 2011 and finishes on the 5th May. We are having a closing event (as opposed to an opening event) and invitations are extended to anyone who knows us or who is interested in seeing the show. All details are on the poster below. The “closing” is on the 4th May.Please do come along, we start at 6 p.m. Anyone who wants to buy work can collect and take away at this event. The exhibition is finally up and looks great. Of course we had the usual panic about fitting it in (hence the title of the show) but knew that we would. I have created two new pieces for this and used an iphone for the images, certainly makes an interesting comparison to the more studied street photos. Although I have recently been haunting the streets with my camera again, I decided to choose my “best” six from the past two years, which come under the title of “All the World’s a Stage”, and I am also creating a smaller colour “explosion” which may or may not be ready for the show. Nightmares all round last week with Naomi having to have surgery on her hand, Traci’s first cast going wrong and us all STILL unable to be in the gallery at the same time to agree on space allocation etc. Also, we couldn’t use their ladders due to health and safety rules so it was interesting watching Dave and Val get round that as they “installed” Val’s work! I can not describe the feeling that I got as the last bit of work was put in place, it seems even more of an achievement than the M.A. Show was. What a great mix too; audio, a book,sculpture, printmaking, watercolours, photography, textiles and sculpture. Art is like a pulse that continues to beat inside us all, no matter what is going on, it drives us, it inspires us, it delights us.